The much anticipated and highly controversial WordPress 5.0 is scheduled for release tomorrow, the 6th of December 2018. With only a few days notice from the WordPress team, it is important that we all brace for impact with a clear understanding of the status, compatibility and bugs between ACF and Gutenberg. We have been working hard to juggle the difficult task of Gutenberg development whilst still supporting an existing product. Yet, due to buggy betas, fast paced release candidates and lack of documentation, we are unfortunately not ready for the WordPress 5.0 release. The only crumb of comfort is that we are not alone. Many talented product developers have also spoken out about the irresponsible nature of rushing such a major release. Although we are not 100% ready, we are well on our way to releasing ACF 5.8 with one of our biggest features yet – ACF Blocks! ACF 5.8 is currently in its 3rd beta version, and will soon hit release candidate stage. This version will be fully Guten-patible and provides a PHP framework for registering custom block types! Thank you to everyone who has helped test ACF with the new editor and especially to those who have reported bugs, submitted fixes and requested features. You are helping us build an amazing plugin, and we love seeing what you are doing with it! The reality is ACF 5.7.7 (the latest stable version) is not 100% Guten-patible. There are a few areas in the post edit screen that clearly expose broken and missing functionality. 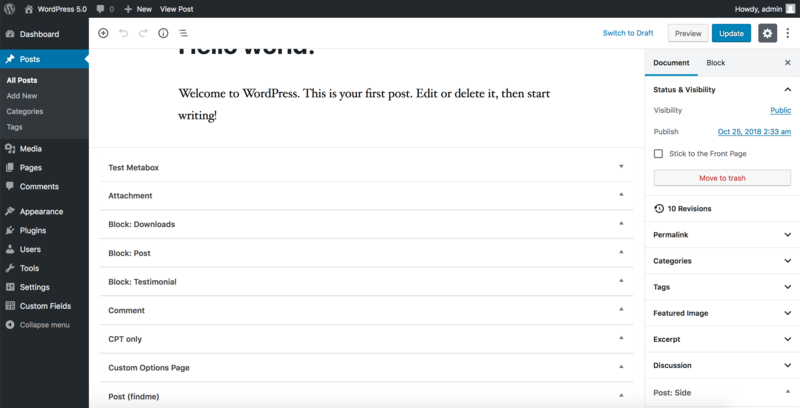 Now that WP 5.0 is deemed stable, we can expect a flurry of documentation, blog posts and code examples to better demonstrate how to interact and customize the new edit screen. These missing articles have been a major hurdle in our plugin development and as they start to surface, we will be able to resume our previous productive pace. In the meantime, please be aware of the following. All field groups created with the Advanced Custom Fields plugin are shown as empty visible metaboxes when editing a post irrelevant of those field group’s location rules. This is due to a decision in Gutenberg to override the display:none CSS that ACF adds to “placeholder” metaboxes – used to update metaboxes dynamically whilst editing the post. This is a known issue that has been bumped to WordPress 5.0.1. All field groups shown in the “content area” look awkward, detached and slightly broken. More care should have gone into the styling of metaboxes to avoid such a disjointed UI and UX. This is also a known issue that has been bumped to WordPress 5.0.1. One of our favorite, simple and intuitive features is the ability to update metaboxes dynamically whilst editing a post. For example, metaboxes will hide and show depending on location rules when changing the post template, format, parent and other post attributes. Another highly used feature in ACF is our AJAX powered validation. This allows developers to highly customize the validation process via PHP whist providing convenient feedback to the user when a field value does not meet its requirements. Similar to above, this feature is no longer working and is scheduled to be fixed in ACF 5.8. Due to major changes in the WP 5.0 post edit screen, the “high” position is no longer working. Field groups assigned to this position will not show in Gutenberg and we recommend changing these from “high” to “normal”. We will look at solutions for this, but are unsure if it will be possible. The talented developers over at Delicious Brains just released a thorough and detailed guide for plugin and theme developers to help get ready for Gutenberg. There are some code example gems that I highly encourage you to read in preparation for tomorrow’s event. Read the full article here. If you haven’t already, please do install the Classic Editor plugin on your personal and client’s websites. This will best allow ACF to continue working with WordPress 5.0 whilst we iron out the kinks mentioned above. This plugin will be maintained until late 2021 which by then, it is safe to say we will have everything working 😀. We don’t understand the rush to release this major version and disagree with those who believe it is necessary for the project to succeed. Ultimately, it will damage the people who use WordPress. Our community has already become divided, our developers are burnt out and conversations online quickly become chaotic. We are all left wondering why. That said, we can see Gutenberg’s larger vision, and we are on board. We just wish more consideration was taken towards the beautiful WordPress development community by proving a strategy for plugin and theme developers to migrate, update and adapt their projects over a clear and well communicated timeline. It is important to note that although Gutenberg has been under development for quite some time, it has only been “stable” for the past few months providing a very short window of opportunity to build with, test with and help with. I would like to reiterate the words of Pippin Williamson from his recent (and great) podcast episode on WPWeekly. He is spot on in his prediction that Gutenberg “will have fundamental and deep effects on the WordPress ecosystem.” and that “over the course of the next 6 months, we are going to see whether it is the greatest thing or the worst thing that’s ever happened to WordPress”. The full episode is worth a listen, but for those short on time, skip to 1:11:10. We’re working on some new and awesome things for WordPress. Custom fields aren’t going anywhere, and neither are we.